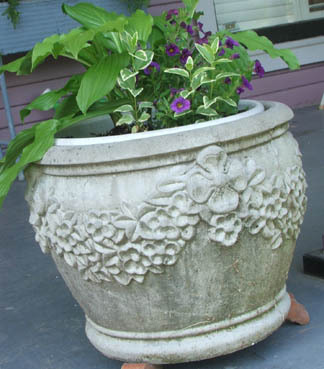 As much as I like gardening and although I seem to wind up with plants in pots every year, every year most of my large pots wind up being a disappointment. The reason for the disappointment varies. Sometimes I've tried a mixture of things and one plant died, or they just didn't grow the way I wanted them to. Sometimes I've tried keeping it simple and using one sprawling, flowering plant. Those years I usually forget to water the pots and wind up, if not killing the plant, leaving it looking pathetic for the rest of the summer, until I rip it all out in the fall and stick in mums. There have been two exceptions to my potted plant failures. I have always had lovely and abundant basil growing in pots. This is probably because I've pinched it, plucked it and taken very good care of it. Or maybe basil just likes me. The other plant that has done well consistently for me in a pot is hosta. Those I have totally ignored, not watered for weeks, stuck in full sun when I knew they are shade plants and they do beautiful things for me, sort of like the puppy that will lick your hand even after you yell at it. Hostas fill in pots well, overwinter in the well and generally give me a nice bit of potted plant life with very little work. Paired with some vinca, which also can survive a lot of abuse and you can have a very interesting pot without much effort. This year, this formula for pots has been especially important for me. I don't have extra money to spend on a lot of plants thanks to renovations, our trip to England and all the other things that are costing money this year. Not only do I have a tendency to find my potted plants looking pathetic by mid-summer, but then I tend to want to go buy even more plants to hide the shame of my plant abuse. I just can't do that this summer. I had four pots I wanted to fill in my front yard. Several more in the backyard got herbs, which although tiny, I've already been putting to work in meals. The four in the front yard are purely decorative and I want them to be pretty, but I just can't justify spending much on them right now. So I started hunting around the yard. I already had some potting soil left over from other years. I divided up some hostas, ripped a little vinca (for flowing out of the pot) out by the roots and stuck vinca and hostas in all of the front yard pots. It might have been more interesting to try something different for the other two and lamb's ear might have been interesting. Some variegated hostas would have been pretty, but I was working with the first stuff I laid hands on. For the two pots on the front porch, I splurged on a small pot of million bells. They and their bigger cousins the wave petunia are fairly unkillable and even if I do kill them, the hostas and vinca should keep the pots looking nice. So far I'm quite pleased and especially that I managed to fill four pots with something attractive for well under $10 by using what I already had and what I knew would work well for me. Great idea. 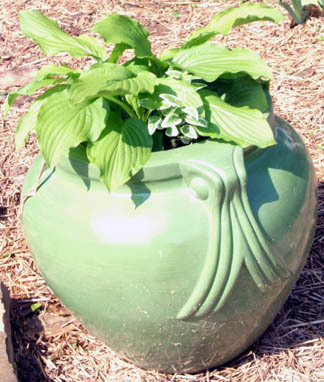 I've used perennials in pots, but not hostas. I have two large pots that get regularly ignored because they are not near my regular walkways. Hostas and vincas...just the right combo. Awesome idea they are so pretty! I would love to be able to do something with hostas, especially as I have quite a few shady spots around the yard. Unfortunately, the deer just hoover them up.